If someone close to you has died, you may be considering in loving memory decals. You place these decals on the back windshield of your car and they serve as a reminder as well as a tribute to your deceased loved one. Doves Decals features 15 different categories, 14 different colors, and 15 different sizes. Categories include images related to Christian, Animals, Flowers, Vehicles, Aircraft, Photos, Hunting and Fishing, Sports, Military, Music, Fireman, Medic, Police, Native American, Ribbons, Rodeo, Racing, and Miscellaneous. Most decals start at just over $10. InMemoryDecal.com has a limited selection but the ones they have available are slightly different from other decal websites. You can choose square or oval decals with a message at the bottom of them. Most small decals cost less than $10. Vinyl Disorder decals are designed to last on car windows for at least six years. They offer both personalized window decals and personalized stickers of various shapes featuring beautiful background photos. This company can also transfer photos to decals and have a wide variety of options for decals including pet memorial decals. Full-color stickers start as low as $8. CarStickers offers personalized memorial car decals for as low as $10. They have an impressive collection of military memorial stickers in addition to religious decals and simple decals featuring personalized text. Decal Boy has memorial decals starting around $10 that are weather-resistant and won't get damaged by cleaning products. This is a good option if you're looking for simple memorial decals that will last. Some people use these decals because it helps them feel closer to their loved one because it reminds them of the deceased person each day they get into their car. It also helps some people grieve because they feel that their loved one is with them wherever they go. Individuals purchase them to remind others to cherish their own loved ones because no one knows when something could happen to one of them. Fundraising is another reason why people use memorial decals. If you started a fund in honor of your deceased loved one, the decal can spread the word on how people can donate to it. Many styles of memorial decals are available. Choosing the right one has much to do with your own personal taste as well as what your deceased loved one would find special. You can purchase one with only wording such as "In Loving Memory…person's name, life dates, and a message." You can also find some with all of those details along with an image. The image you choose can be something you like or something representative of your loved one. Since you can customize memorial decals, many places that sell them will allow you to have whatever wording you would like as long as it fits on the decal. This is because it's a sticker that is printed on, which is why you can have such a variety. Just because your loved one has died doesn't mean the love you have for him/her has ended. 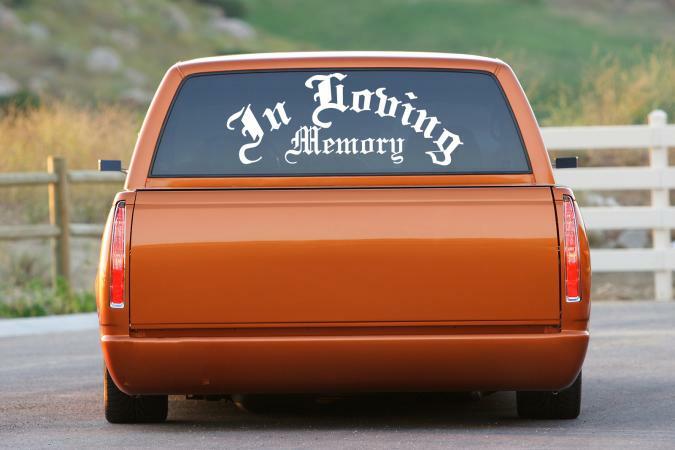 An "In Loving Memory" decal helps you express your undying love for your special friend or family member. If you are considering one for your vehicle, make the purchase, it will help keep your deceased loved one close and help the grieving process.